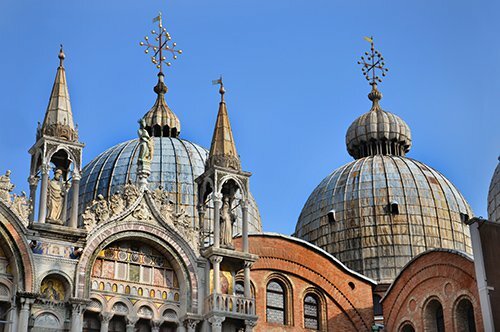 WHY VISIT THE ST. MARK'S BASILICA? This Basilica will leave you fascinated with its Byzantine style architecture, its facings and its interior decoration. The five domes, the walls and the floors have been covered with golden mosaics by Venetian artists who assimilated the style of the Byzantine decoration which they combined with embellishments of East and West that will leave you breathless. The mosaics are also present in the facade divided by five orders of arches where there is a panoramic balcony from which the Venetian doge attended the ceremonies of St. Mark's Square. The Basilica of San Marco rises during the 800s on a pre-existing church as a place where the relics of Saint Mark were established. A fire destroyed the existing basilica at the end of the 900s and was built a new one later restructured by Doge Domenico Contarini. A second consecration was made in 1094 to the new Basilica that took up the characteristics of the Basilica of the Holy Apostles of Constantinople. From 1807 the Basilica was used as the chapel of the Doge and officially became the Cathedral of Venice. The internal decoration was made in gold mosaics that go back to the works made between the 12th and 14th centuries and in the 16th century the drawings of Tintoretto, Tiziano and Veronese were reproduced in some mosaics. 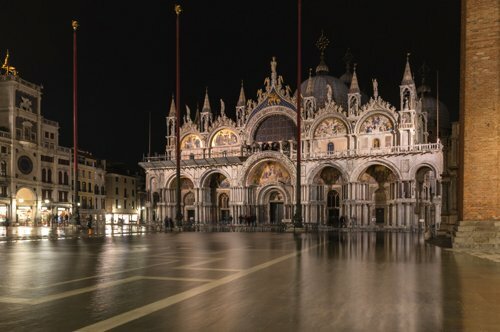 WHAT IS THE ST. MARK'S BASILICA NOWADAYS? The St. Mark’s Basilica is one of the symbols of Venice and Italy in the world. It has a Greek cross plan with the altar placed in the apse area and is crowned by five domes, one main and four smaller. Inspired by the Church of the Twelve Apostles of Constantinople, it carries with it a totally oriental charm. The entire Basilica is 76.5 meters long and 62.6 meters wide and reaches a height of 48 meters. 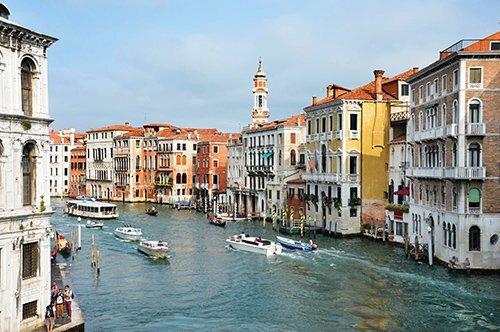 This feature of having a width greater than the height is due to being in Venice, the base on which it was built is largely sandy and therefore for such a large building it was necessary to have a better weight distribution. The interior of the Basilica is decorated with 8,000 square meters of mosaics that represent the stories of the Bible, episodes of the life of Christ, Mary, Saint Mark and other saints. Take into account the subdivision into two distinct parts typical of the Byzantine basilicas given by the upper part very bright with a golden light and diffuse to remember the ethereal world and the darkest part of the earthly world. Did you know that to embellish the area behind the altar were placed friezes called "Palla", word that comes from the Latin meaning cloth or garment? The altarpiece of the main altar of the Basilica of San Marco is so rich in decorations that it is considered one of the most beautiful in the world. A particularity of this "Palla" is that it is only visible during the liturgical celebrations of the Basilica, in all other periods of the year it is completely covered by a painting on a wooden panel. Did you know that inside the Basilica you will find the Ciborium of Saint Mark? Located in the center of the presbytery, it contains the sarcophagus with the body of the saint. The ciborium is supported by four columns of oriental alabaster decorated with incrustations that represent episodes of the canonical and apocryphal gospels. HOW TO VISIT THE ST. MARK'S BASILICA? 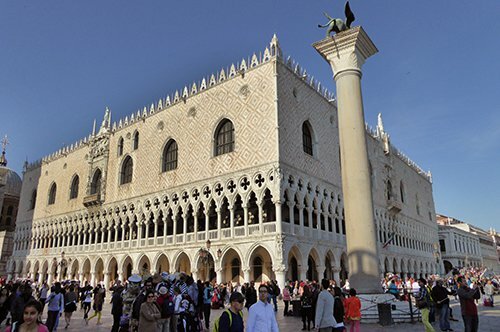 The entrance to the St. Mark’s Basilica is free and you can access following the line at the entrance; however, it is possible to reserve the priority entry for a fee. To fully admire this beautiful Basilica, we recommend that you visit it with a guide. 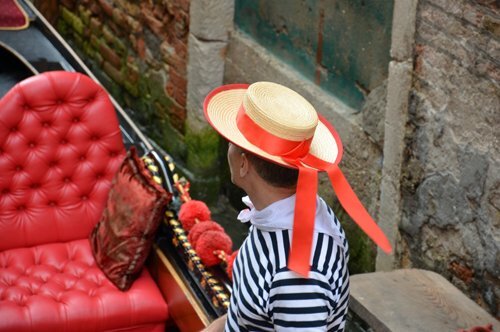 You can participate in a group visit, perhaps combining it with a gondola ride, or you can also book a private guide. 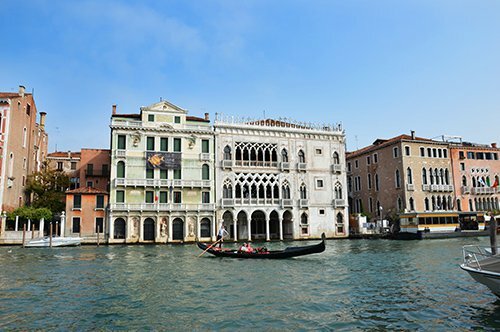 The itineraries of private visits are completely customizable: to the St. Mark’s Basilica Tour you can include a city tour and maybe a visit to one of the many beautiful museums of Venice such as the Doge's Palace, the Accademia Galleries or the Ca' Rezzonico. 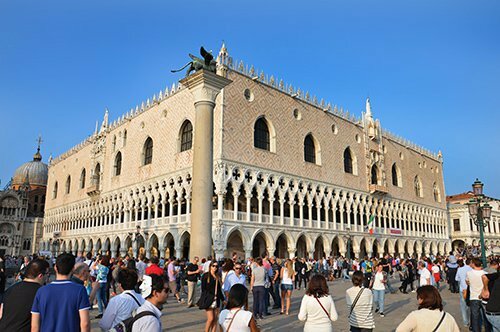 The Basilica of San Marco dominates the homonymous square surrounded by a perimeter of buildings where it is possible to visit some important attractions of Venice. 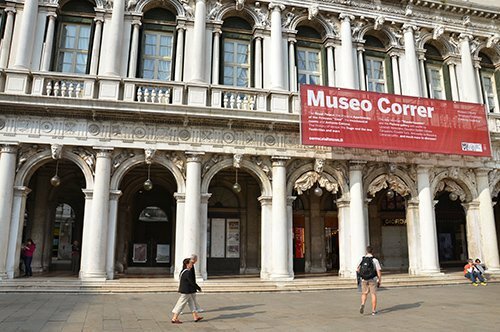 The St. Mark's Square Museums include the Correr Museum born of the precious legacy of the noble Theodore Correr, the Doge's Palace, the historical seat of the Doge where you can visit the Secret Itineraries of the Doge's Palace, the Archaeological Museum born from the donation of Cardinal Domenico Grimani and the Monumental Rooms of the Marciana Library. 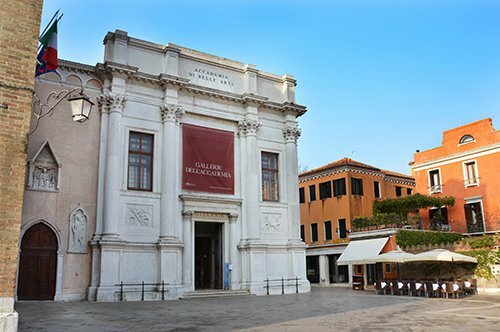 All the Museums of St. Mark's Square and all the Civic Museums of Venice can be visited with a single entrance, with the Venice Museum Pass. 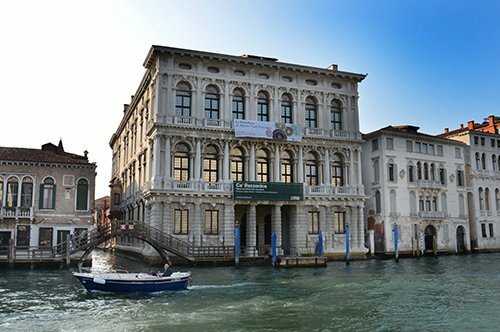 Also you can visit the Ca' Pesaro and the Ca' Rezzonico which are two of the most beautiful palaces in Venice included among the Civic Museums, as well as the Mocenigo Palace that houses the Study Centre for the History of Textiles and Costumes and the House of Carlo Goldoni, a famous Venetian playwright. 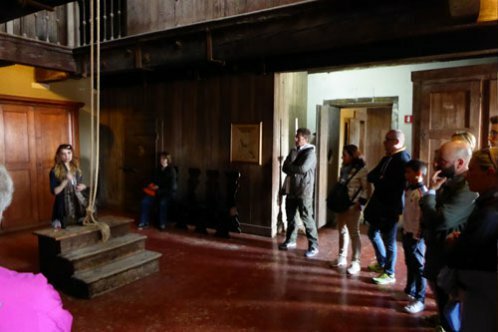 Other houses and other historic buildings that you can include in your visit to “La Serenissima” are undoubtedly the Ca' d'Oro Gallery with its splendid late Gothic façade and the Casa di Marco Polo (House of Marco Polo). 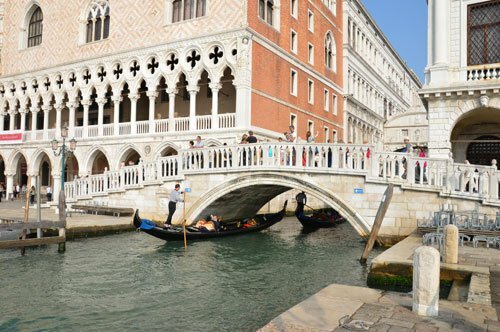 With the Map of Venice, you can find the two most famous bridges in the city, the Rialto Bridge and the Bridge of Sighs, so called because it was the last bridge that the condemned saw before being taken to prisons. 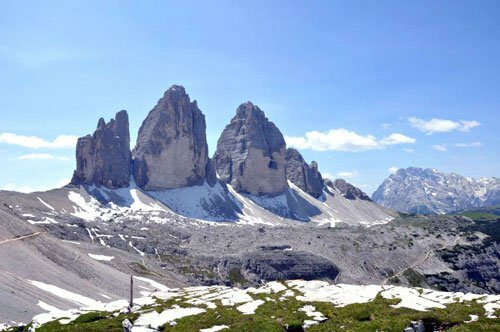 Another itinerary that you could follow is one that takes you to discover other Venetian churches such as Santa Maria Formosa or the Basilica of SS. Giovanni and Paolo, you can also visit the Accademia Galleries of Venice. 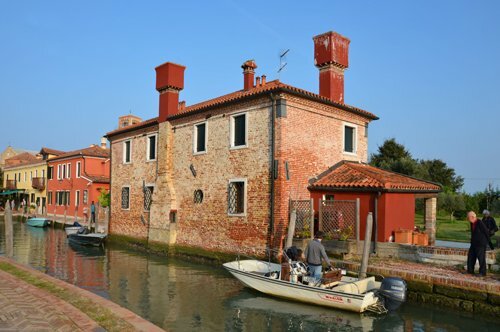 If you want to try a unique experience, visit the three Venice Islands Murano, Burano and Torcello.  Here you will find the Glass Museum in Murano and the Lace Museum in Burano.